One of the frustrations of our original kitchen was its faucet, which poured water out of the valve body onto the counter whenever we turned it on. But we tried to save it when we renovated. Its manufacturer, we learned, has committed to keeping repair parts available even for units that are decades old. I had to visit three stores to find them, but eventually I did and we were able to get it to work as it should … mostly. 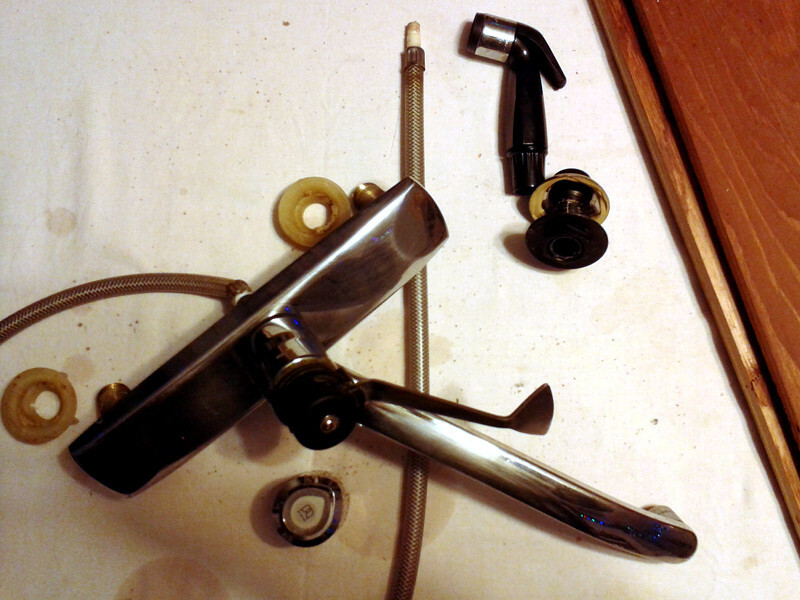 All the rest of its parts had nearly 30 years of wear, though, and we haven’t been able to keep the lever-handle on tight. 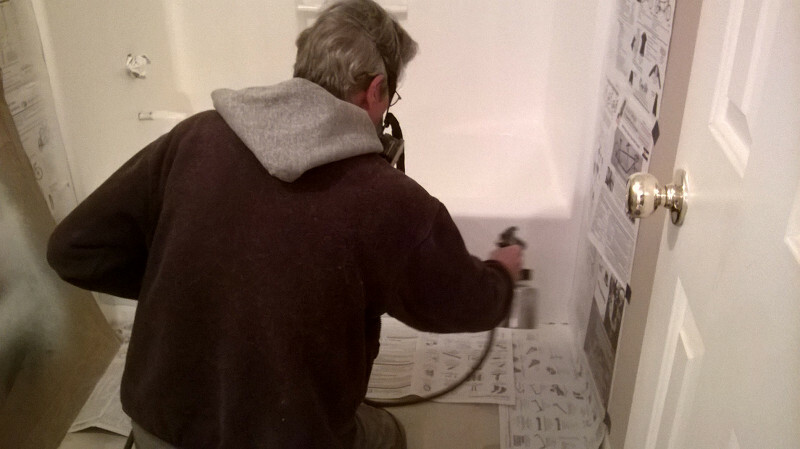 When the faucet started dripping last week, we decided it was B.E.R., Beyond the cost of Economic Repair. We could’ve bought a new faucet for what we spent on the repair parts in this one … more tuition paid to Renovating U! As I draft this post, Nimue is installing a new faucet with simple, old-fashioned double handle valves. I look forward to washing up at a sink where the water runs where it’s supposed to! My Dad passed two years ago, but he left me his workshop, in spirit if not the letter, years before when he lost his eyesight. For a long time I was reluctant to change anything, but I’ve worked through that and am slowly cleaning it out. On my last visit I spotted a rechargeable screwdriver plugged in an outlet. It’s capacity to juice up and be used was long gone, though. 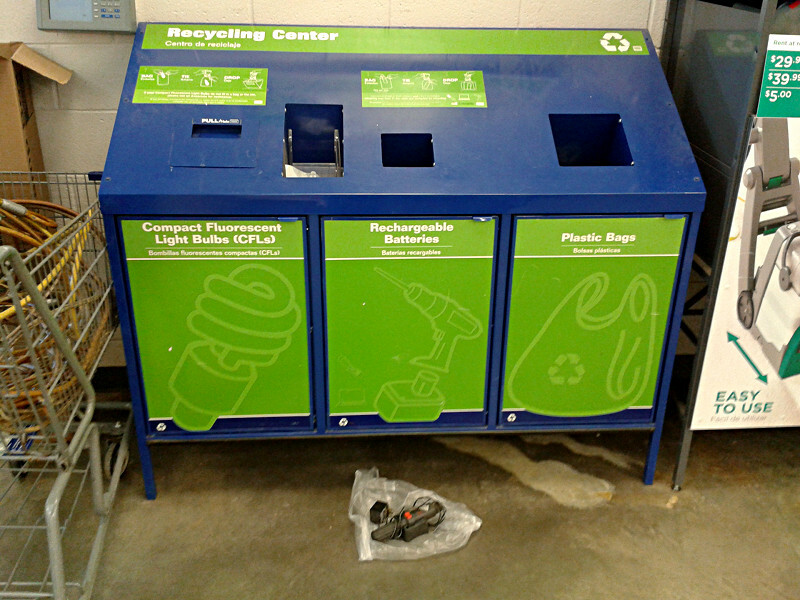 The blue big box home improvement warehouse accepts rechargeable tools for recycling. I dropped it in the bin with gratitude. Both bathrooms at Casa de WIST had unremarkable, if serviceable, fiberglass tub surrounds in a 1980s almond color. They presented us with a moral dilemma. As we renovate, we try to keep our footprint from growing. We replace what we must, repair what we can, and repaint and cheerfully re-use everything else. But Nimue and revdarkwater, your hosts, are not warm-palette people. Besides, the tub-shower units were starting to show their nearly 30 years of use by resisting our best efforts to clean them. It took a lot of work, but last year we had excellent results saving our tired laminate kitchen counters with Rustoleum’s Countertop Transformations product, which bonds a new color coat with a durable epoxy topcoat. 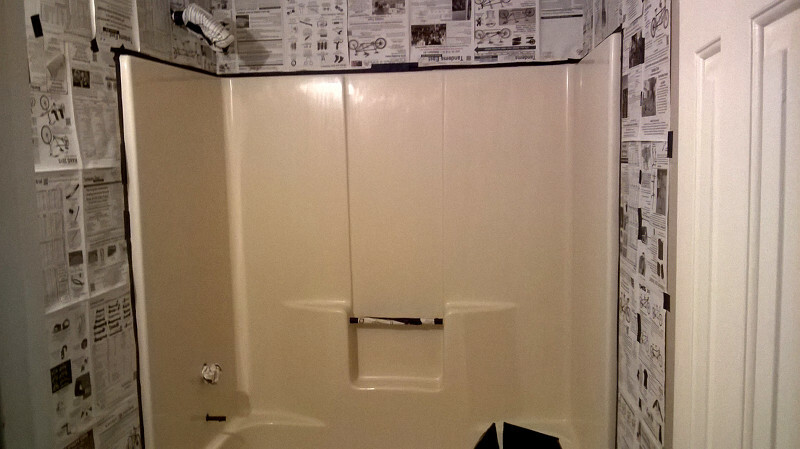 So we decided to give Rustoleum’s Tub & Tile Refreshing Kit a try on the surround in the upstairs bathroom. We special-ordered our kits from the orange big box home improvement warehouse. 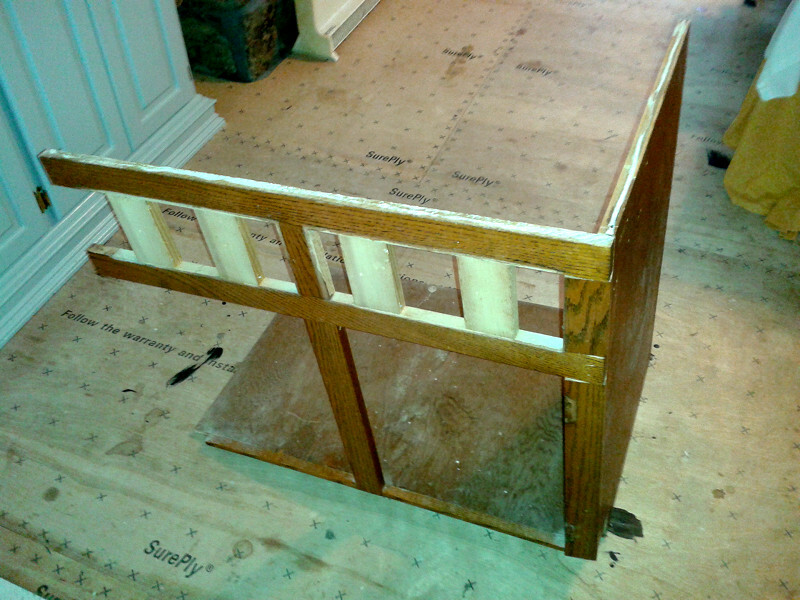 A tub-plus-surround takes two, which cost us about $50 total. If there’s ever a time to indulge in perfectionism, it’s during preparation to paint something. We followed the instructions to the letter, cleaning, de-liming, uninstalling hardware, wet-sanding, and allowing to thoroughly dry. Nimue taped off the unit. It’s not perfect. To our horror, while we were waiting to apply the second coat, we realized that some water had seeped out of the supply line, even though we’d made certain the valve was fully off. We don’t know yet what the final effect on the finish will be. Some more “fussin'” may lie ahead. Otherwise, though, it’s pretty good. And it’s white! If anyone decides to use Rustoleum’s Tub & Tile Refreshing Kit because it worked for us, please, do use a respirator (most epoxies are frankly toxic), ventilate well, and be prepared to clean a fine dust of overspray off of everything within several hundred square feet. Comments welcome … here’s a poll: paint or put-up-with? The conversation with KonMari I promised for today’s post must be rescheduled; sorry! But here’s today’s shed. 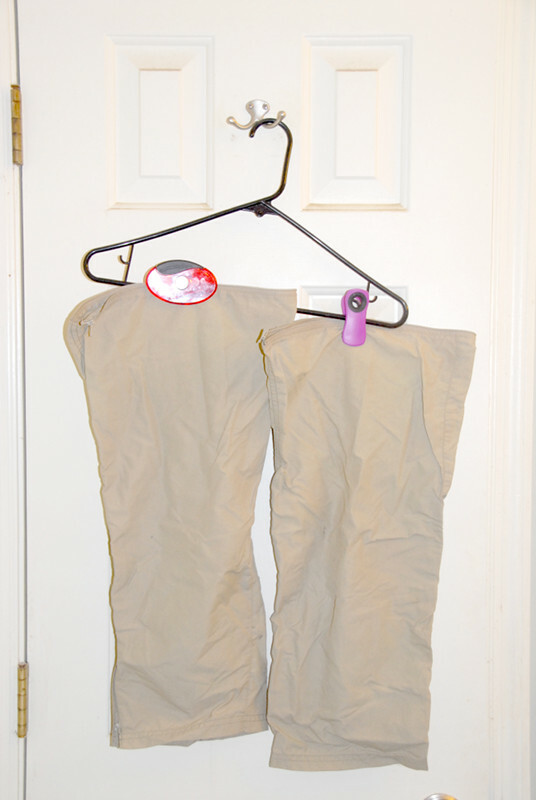 It’s another item I’ve kept out of the wastebasket awhile so I could write about it on WIST. Though we all hardly look a day older (ha! ), some time ago my good friends Larry and Debbie wed. I had a part in their ceremony, and they gave me a nice leather wallet as a thank-you gift. I didn’t start using it right away, but when my cheap nylon wallet began to part at its folds, I moved cards and cash into the new one, whereupon it and my hip pocket formed a relationship that lasted about 25 years. The wallet traveled many miles, soaked up a lot of sweat, and survived a two-hour sluicing of salt water we received when a high surf got up and a fishing boat I was on had to dash for harbor. I hardly look a day older (ha! ), but the wallet … it became my portrait of Dorian Gray. First its complexion darkened and grew course. Then creases turned into cracks. Finally, it seemed to lose any sense of structure. I loathed giving up on it, but my stuff was spilling out whenever I opened it. I like my new, cotton duck wallet manufactured by Jandd, a company I trust. (We use their bicycle panniers for our touring.) But it’s not the good old familiar lump in my pocket. Nevertheless, for everything there is a season. As KonMari would recommend, I will hold my old wallet to my heart, thank it for its faithful service on thousands of ordinary days and not a few adventures … then let it go. 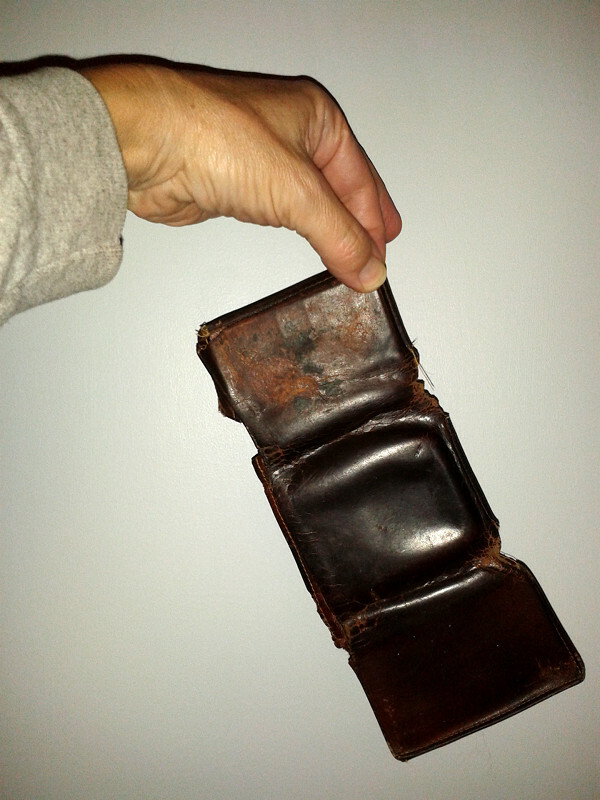 Comments welcome … actually, I wish I could compost the wallet; it’s mostly leather and therefore organic in origin. I tried that with a pair of shoes, however, and after two years, they still turned up in the pile looking like shoes. Suggestions for accelerating the process? Or extending my patience? Last November, Nimue and I met KonMari (not in person, but through her book The Life-Changing Magic of Tidying Up: The Japanese Art of Decluttering). We found much in it to complement what we’ve learned over years of pursuing what we used to call “organization” and now think of as living in spaces that are beautiful and useful. The lilies of the field would be ashamed to be arrayed in such as these! 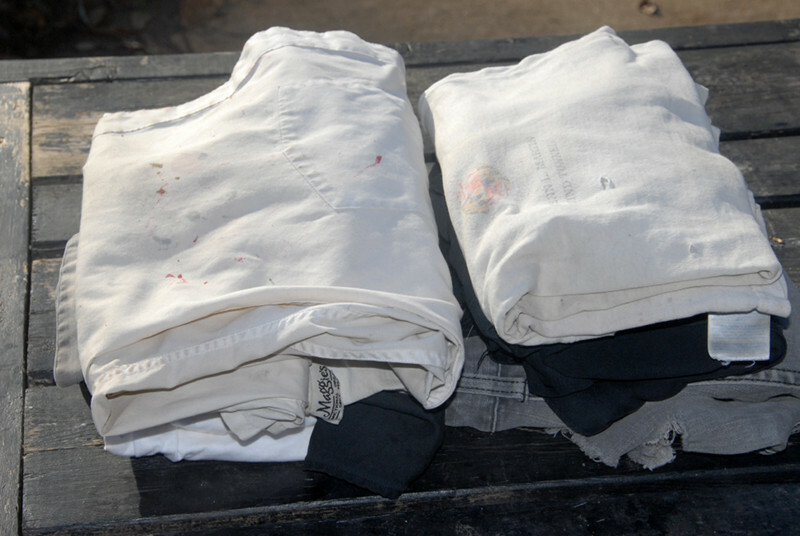 On top are work clothes that were wearing thin or getting stiff with paint. They were easy to shed. Below them, however, are black silk shirts that were such favorites they have been our second skins for years. Even with good care, however, warp and woof begin to part after a decade of constant use. We hadn’t yet admitted it was time to let them go. KonMari’s ritual of embracing an item while thanking it for the service it’s given, funny as it may sound, helped us act on the decisions we realized we’d already reached. I’ll probably have more to say about KonMari’s principles and techniques in future posts. For tonight, however, I’ll conclude with a grateful bow in her direction. Comments welcome … have you ever hugged your clothes? 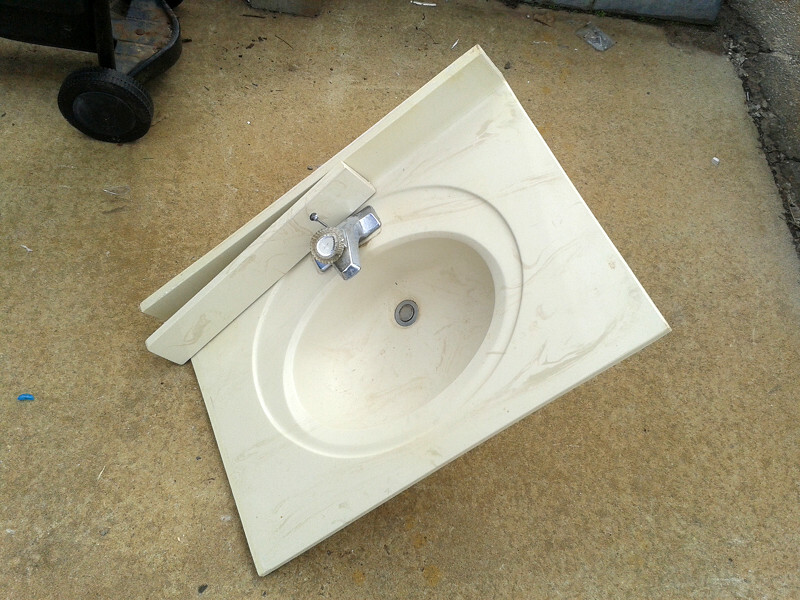 Our upstairs bathroom’s integral countertop-sink was cast of a decent composite material and would still be perfectly serviceable … in, we judge, a somewhat larger “little room” than ours. The Habitat for Humanity ReStore is our favorite place to donate and acquire used building materials. The only downside to shedding there is that I eye all the other great stuff and have to master the temptation to take another project away when I leave! Comments welcome … is there such a thing as a “sink cost fallacy”? What’s been cooking today at Casa de WIST? The duck made its second appearance, this time as Peking Duck (with guidance from the infallible Jamie Oliver). For the pancakes, I used Mexican flour tortillas … thicker, but available even at gas station convenience stores in the southeastern US. I thought they were an acceptable substitute, but necessity is the mother of invention. 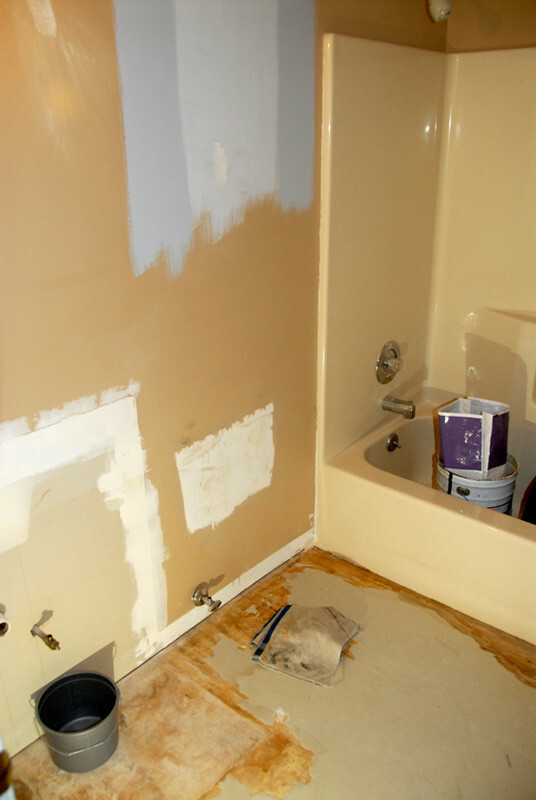 Earlier today, I applied drywall compound to the many defects in the bathroom’s walls. Once it dried, Nimue hit it with a sanding screen. At least one more round of patching and sanding is in order. Maybe tomorrow we’ll finish that and start rolling on primer. The epoxy for renewing the finish on the fiberglass tub-and-shower is no longer stocked at the home improvement warehouse; we had to special-order it and await its arrival this coming Saturday. Oh well, that gives us time to get our ducks in a row (heh-heh). I knocked the cabinet down to panels so I can trim a few inches off them with the table saw. I love the idea of taking something that wasn’t working very well from one part of the house and re-making it so it can serve in another. The next time you see this, I hope there will be both more and less of it to see! It’s not just that they buzz. I could remedy that. The weak link in an audio speaker is the foam ring that connects the cone to the frame. They’re available in repair kits. 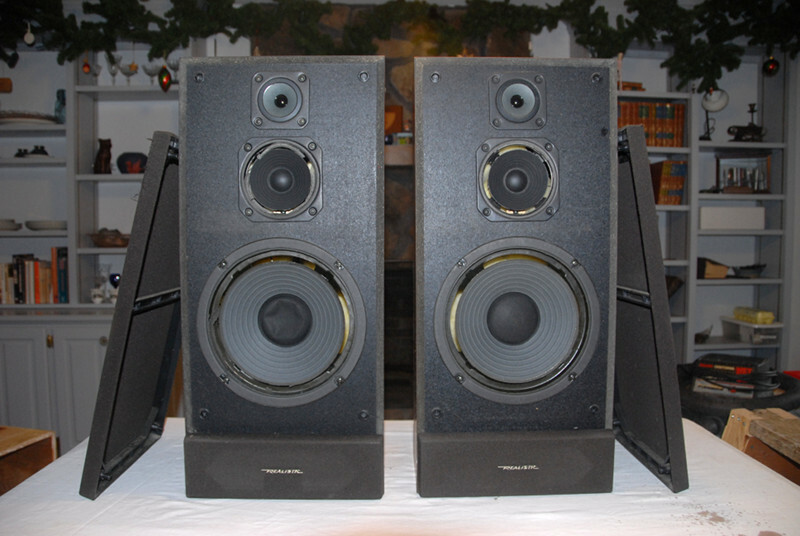 They aren’t cheap, but cost a lot less than new speakers. But we’ve moved on, too. Nimue listens to her podcasts through earbuds. I use them, too, on long solo car trips. Most of the time, I’d still rather that music arrived at my ears from at least a couple feet away, but a pair of computer speakers pushes it well enough. When I still need to really rock out, I’ve got an amp-and-speaker thingy (I don’t know what else to call it!) that turns any mp3 source into thumping thunder. So here’s the plan. There are makers out there, I know, who love a little hands-on and, not incidentally, have a fascination with vinyl LPs [upcoming WIST post!] and vintage stereo equipment. Despite my discouraging results in the past with the medium, I’m going to try to use the “free” category on craigslist to connect with someone who’d like to take on the project. Comments welcome … remember when music took up several square feet of space? Were we wrong? Today we turned our upstairs bathroom into a shell of its former self. I thought I had a “before” photo on my hard drive, but it appears to be archived off somewhere. You’re spared that image of a cramped room, painted brown and furnished with builder’s-grade fixtures in “almond” shades. Nothing in it had been changed in the 28 years since the house was built. Ah, but today, we took up the curling and yellowing sheet-vinyl flooring. (I regard every trip to the construction-and-demolition landfill as a capitulation, but that’s where it will have to go.) We’ll lay ceramic hex tiles in its place; with good care by subsequent owners, they might last the next hundred years. 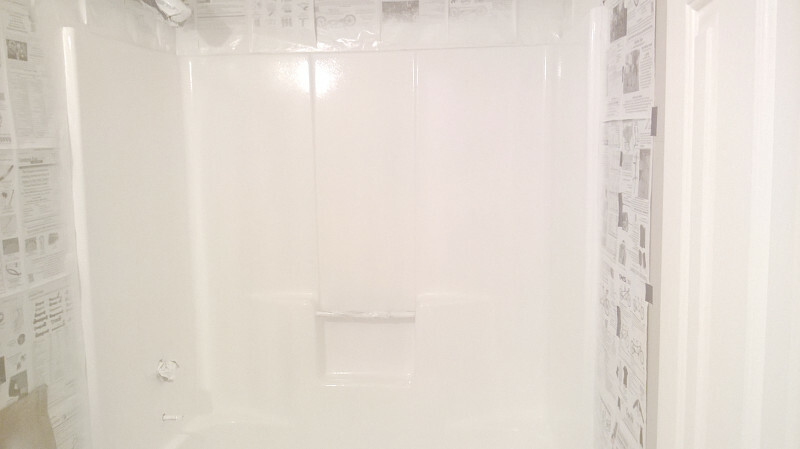 We’ll try to give the tub and shower surround an update (and color change to white) by applying an epoxy coating. It’s an experiment, but we had good luck refinishing the laminate countertops in the kitchen with a product from the same manufacturer. Tomorrow, renovating continues! With it we release the weight of what what doesn’t “spark joy” and, thus, lighten up! Comments welcome … does it seem that, more often than not, we must destroy in order to build? After a long hiatus of posting, we’re back, or at least shall try to be. ‘Nuff said about that. Three autumns ago, as the winter holidays approached, I saw ducks in a freezer case at our Aldi. A vision of browned, glistening fowl ringed with roasted red potatoes, rutabagas, carrots, parsnips, carrots, brussels sprouts, and onions danced before me. The rich, warm smells wafted out of memory. It felt like Thanksgiving, Winter Solstice, Christmas and New Year’s all at once. I bought a duck. And brought it home and put it in our freezer, because it wasn’t quite the holidays yet. Holidays being busy as they are, the duck stayed there, because it just never seemed to fit into plans. Oh well, we can enjoy it anytime, I reasoned. Maybe I’ll even rig a rotisserie and roast it over coals outdoors. Maybe we’ll have Christmas in July. Instead, the duck starred in its own one-bird version of Frozen, which had a very long stand. It played to a packed house of ice cubes, pizzas, my bank of saved seeds, cans of juice concentrate, and the ever-changing contents of our broth bag. But, former theater person that she is, Nimue knows that every production must eventually come to a close. Not another year, she insisted. 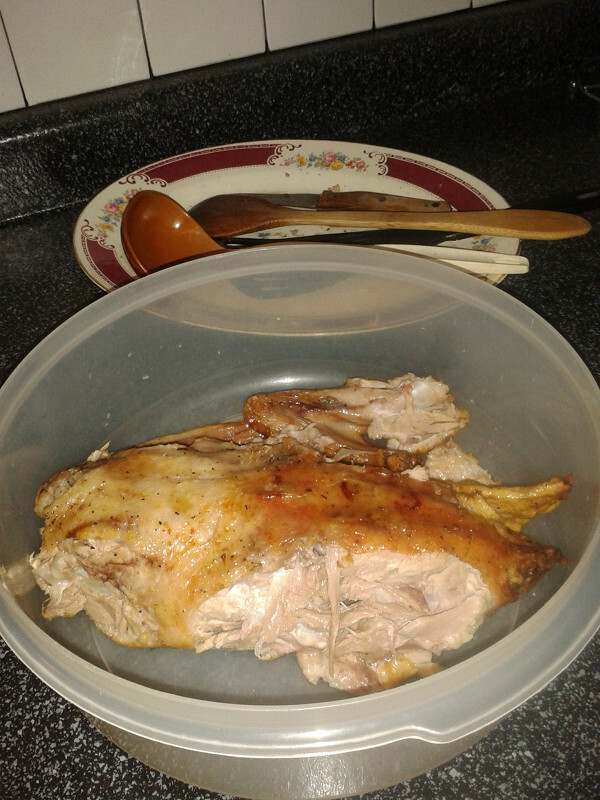 The duck finally had to roast. Comments welcome … has anything abandoned all hope in your freezer?